Over the past two months, a commercial for Israeli satellite television provider Yes has gone viral in Israel, topping the country's radio playlists and turning its star, 20-year-old Stephane Legar, from an Instagram and Youtube hit into a household name. Israel-born Legar, a soldier in the Israeli military, was born in Israel to parents from Togo who met while working at the Nigerian embassy in the country. While he also found success as a singer over the past two years, with several songs under his belt, he is a dancer first and has made his first foray into the Israeli music industry dancing for others. Titled “comme ci comme ça,” so-so in French, the French and Hebrew song cooked up by advertising agency Mccann Tel Aviv lists many of the things Israelis like to complain about. Sunday traffic jams—the Israeli work week starts on Sunday—are comme ci comme ça, sings Legar. Israel suffers the worst traffic congestion among OECD countries, according to a March report published by the Organization for Economic Co-operation and Development (OECD) and the International Monetary Fund (IMF). Education in Israel is “comme ci comme ça,” Legar continues. Israeli students come in the bottom third of OECD countries in mathematics, science, and reading skills, according to OECD data from 2015, the most up-to-date data by the organization. Wages in Israel are comme ci comme ça, according to the song. Israel had a net national income of $32,000 per capita in 2016, under the OECD average of $35,300, despite being in sixth place among all 35 OECD countries in terms of hours worked. While Israeli Prime Minister Benjamin Netanyahu and several of his ministers are at the center of ongoing police investigations, Israel scores relatively well in global corruption reports. In the annual Corruption Perceptions Index published on February 2018 by anti-corruption non-profit Transparency International, Israel was ranked 32 out of 180 countries, above South Korea, Spain, and Italy. When it comes to geopolitics, the commercial song goes for "everyone wants peace, but no one has the time," before moving on. The song makes hardly any mention on issues including international relations, sense of security, and social and religious divisions. Legar himself has previously spoken about the racism he has experienced growing up as a black man in Israel. The commercial has become one of Israel's greatest summer hits, garnering almost 21 million views on Legar's channel. Israel’s population reached 8.8 million in 2017, according to a January report by the Israeli Central Bureau of Statistics. Last week, the commercial was crowned as both the most known and the most loved ads currently aired in Israel. Mccann created two version of the song—a shortened one for the aired commercial, and a full video clip making no mention of the advertised brand. 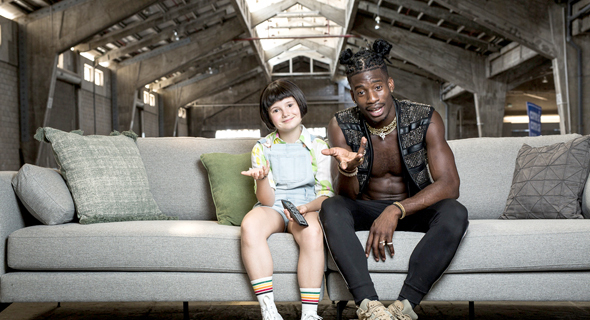 In the ad, Legar explains TV should in no way be “comme ci comme ça.” Yes’s satellite offering is currently competing with video on demand offerings by Netflix, and by two of Israel’s mobile operators, sold for a much lower monthly subscription rates. Over a course of 12-months, Yes lost around 28,000 households as customers, according to the company’s most recent quarterly reports.